Until the age of about four months, the baby can't lay on side or stomach. However, in the dream, he may become tangled in the blanket, arms and legs, lose myself with the blanket or pull it on his head. This leads to the fact that the baby wakes up and cries. 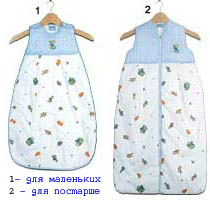 Sleeping bag for baby first year of life is a bag, to resemble long dress with clasps at the shoulders and zipper in the front or side. To sew this sleeping bag your hands will not be difficult. Select for sewing bag-cotton fabric, which is usually made of linen. This material has a very high density and a wide range of colors. For the lining you can use fabric in a contrasting color or bright colors (if the main fabric has a printed picture). As the insulation is well suited certified hypoallergenic polyester (sintepon). Pin is made from paper pattern pieces on the two halves of the shelf (front of the future product) and back to a base fabric and cut them out, leaving 1-1. 5 cm seam. Take this way main parts of the lining fabric and the insulation. Sew manually, the backrest and shelves to secure the insulation. Free quilted stitching all the details on the basting diamonds or squares to the heater is not "lost" in the wash and sleep. Fold details of back and front of the main fabric with insulation and sew them on the outside edge. Sew the zipper to the vertical edges of the halves of the shelves. Fold the top part of the front side and prostrochite from the line of the left armhole to right armhole. The corners of the bottom edge can be rounded. 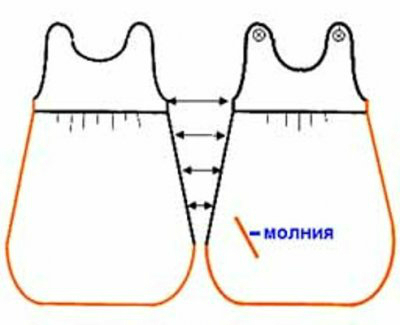 Sew details of lining from armhole to armhole, leaving free hand to the zipper on the shelves. All the slices treat dense zigzag. Remove the upper part of the sleeping bag and insert a lining, prometiste details along neckline and arm openings. Sew the lining to the zipper. Arrange slices of the neck, the armholes and straps for the buckles piping. Make shoulder straps to front loops for the buckles, and the straps on the back sew buttons. 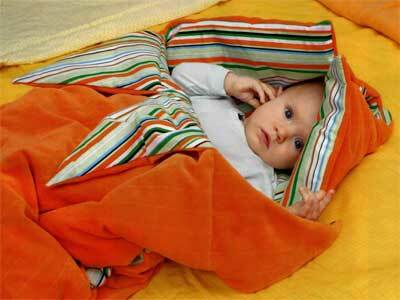 Children sleeping bag is a practical alternative to a blanket, the bedspread and the sheet, which is usually covered with the children. Such bag-the sleeping bag maintains optimal body temperature, ensures a relaxed and safe baby sleep. Sleeping bag - an indispensable thing, if the kid is revealed in a dream or waking up, tangled in a blanket. Sleeping bag can make any time of year, experimenting with the texture of fabrics and filler. Make pattern pattern. When cutting, consider that the width of the shelf is equal to the circumference of the chest of the child, the length of the shelves - the distance from shoulder to waist. The length of the sleeping bag should correspond to the child's growth, and bottom - to be as free as possible, not to hinder the movements of the baby during sleep. Transfer the pattern to the material with a seam 1-2 cm. Take all the details in 2 copies for the front and inside, besides shelves and filled with padding polyester. The batting is cut in the shape only of the bag (the bottom). Sew details of lining the envelope with synthetic padding. Adding internal detail to the face, stitch to the line of connection to the shelf. Remove the parts bag and smooth out the edges. Prostrochite details shelves (sides, straps and the neck), turning, align the edges. Connect the shelf and the bottom. Sew the front part from the back at the side seam on one side, and on the other side sew the zipper. Turn and press all edges. Baste loops on the straps front. Sew buttons to the straps of the back. 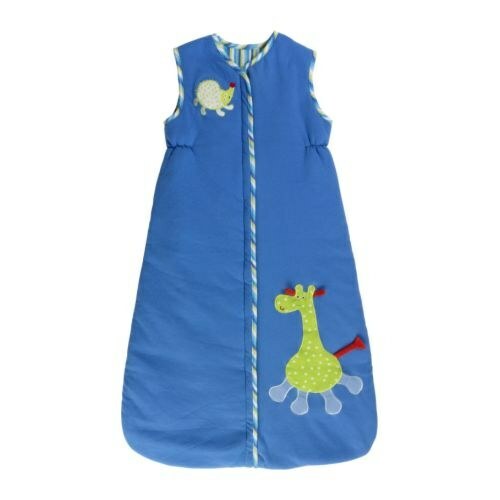 Decorate the sleeping bag with a decorative applique or embroidery. If the sleeping bag is made for infants, all the seams is better to make external, treating them with bias binding.